Bayern Munich will not sell Thomas Muller Bundesliga side Bayern Munich have clearly told Manchester United to stop contacting them regarding the transfer of Thomas Muller. Bundesliga side Bayern Munich have clearly told Manchester United to stop contacting them regarding the transfer of Thomas Muller. Manchester United have been eyeing the German attacker for the past several years, especially after the arrival of Louis van Gaal. The Dutch boss was keen to sign him in the summer window, however he failed but bought Bastian Schweinsteiger. Bayern Munich chief executive Karl-Heinz Rummenigge told earlier today that the Premier League giants should stop asking for Muller’s transfer. The reports have already revealed that the German outfit rejected a big bid in the summer and they will not change their mind. He further said that he cannot close his email account due to Man United emails. 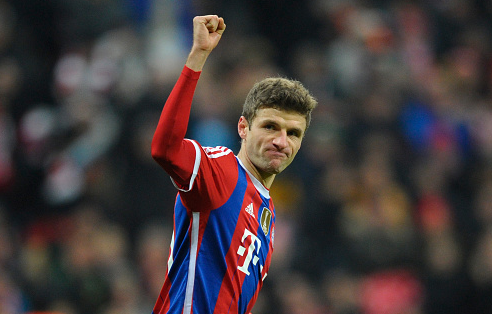 Muller has four year left on his current contract and has no plans to leave the five times Champions League winners. Muller who netted twice last weekend is set to join Germany squad this week ahead of two games against Republic of Ireland and Georgia. The 26-year-old has netted eight goals in even games for Germany. The 2014 World Cup winner need a point to secure their place in the finals of European Championship which will be played next summer in France.